The plaza of old Mesilla with its gazebo is registered as a national monument. As the center of the community, it has witnessed many events, from celebrations to bloodshed. The gazebo is undergoing renovation, so this picture is from their website. 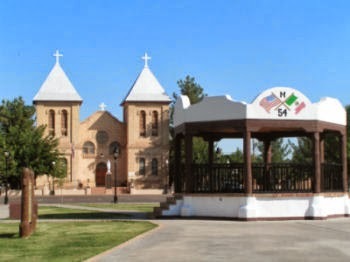 The strongly religious community of Mesilla revolves around San Albino, the Catholic church on the plaza. This brick church was built in 1907 to replace the former adobe building circa 1855. The Rio Grande River has always played an important role ito the people who relied on it for sustenance. . When Mesilla was first developed, the river flowed between Mesilla and Las Cruces. 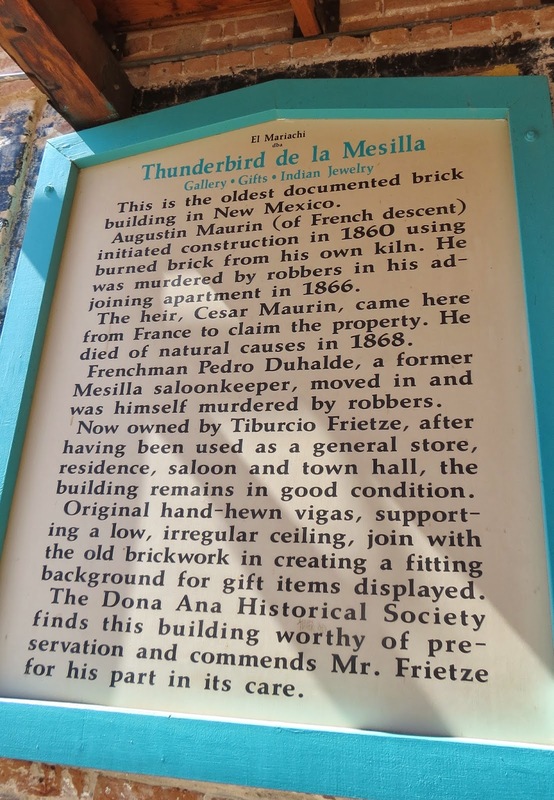 The course changed in 1863, leaving Mesilla an swampy island, bringing floods, mosquitos, yellow fever, and malaria that caused loss of 50 lives in Mesilla. It changed course again in 1865 to its present location. At the moment, the Rio Grande is dry....or flowing underground. Mesilla has been a part of the Kingdom of Spain, Mexico, the Republic of Texas, the Confederacy, and finally the United States of America. The town has a rich history filled with Spanish explorers, Apache raids, the civil war, and the wild west. Pancho Villa and Billy the Kid walked the streets. 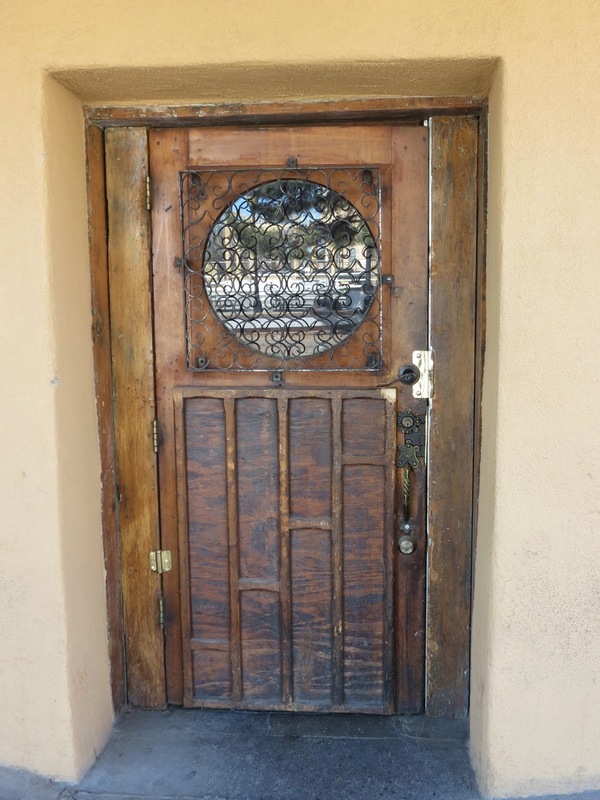 Mesilla was an overnight stop in the days of the stagecoach. 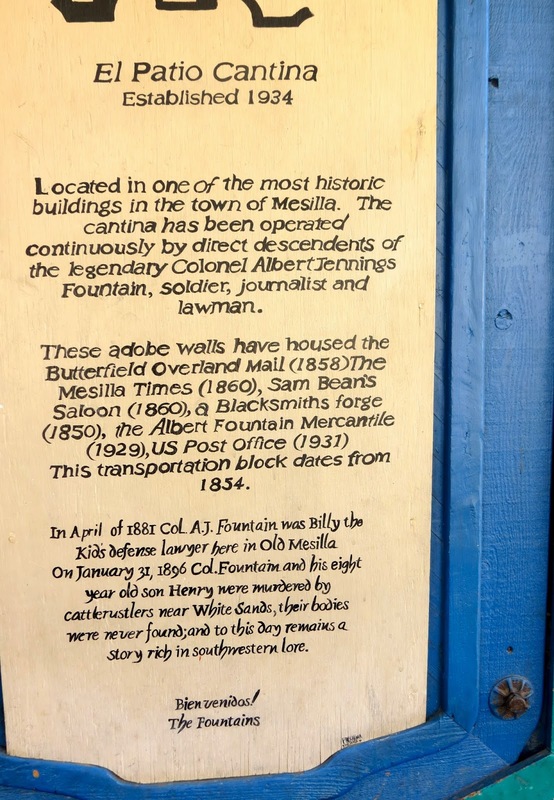 The economy of Mesilla boomed until 1881 when the railroad wanted to go through Mesilla. The people decided not to allow the "Iron Horse" to pass through their property. Instead the people of Las Cruces decided to let it come through their town. At this point Las Cruces began to grow and Mesilla remained a small village. When this happened the county seat was moved from Mesilla to Las Cruces. 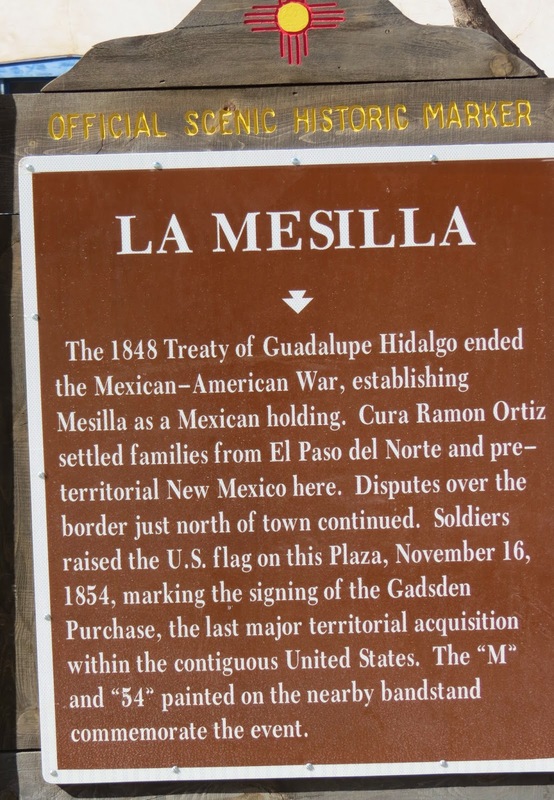 Mesilla was a pro-Confederate community during the Civil War. The battle that occurred here was one of the Confederates' early victories. 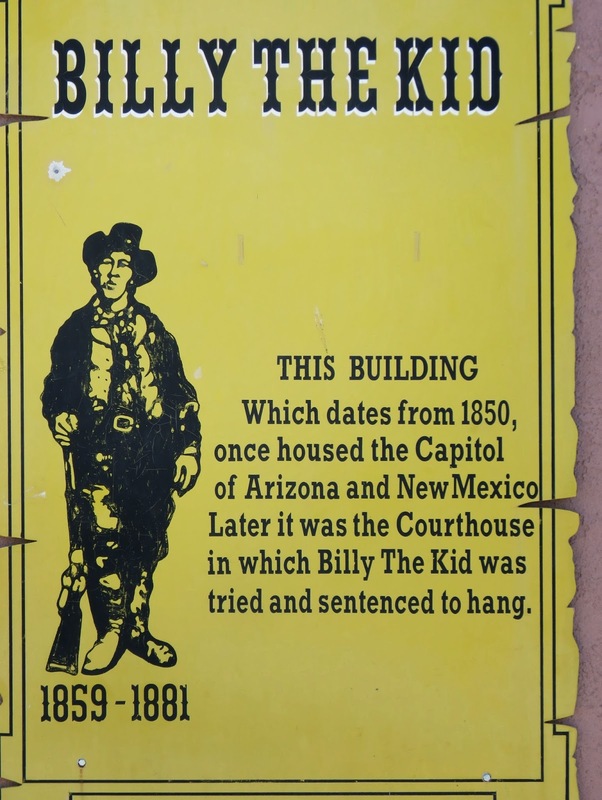 One of Mesilla's most notorious visitors was Billy the Kid. He once slept here. He also slept here at the jail/courthouse, and was sentenced to hang in 1881 for the murder of Sheriff Brady. He was taken to Lincoln, NM, where he escaped, killing two deputies. He was later found and shot at the home of a friend. The old courthouse was built of adobe prior to 1859. The walls are 18 inches thick. The large beams that support the roof are called "vigas." The "latillas" are stripped branches layered between the vigas. A mystery surrounds what happened to the lawyer that defended Billy the Kid, Albert Fountain. This sign says he was murdered, but his body was never found. The Cantina building has been owned continuously by Fountain's descendants. The Cantina is across from the old courthouse. 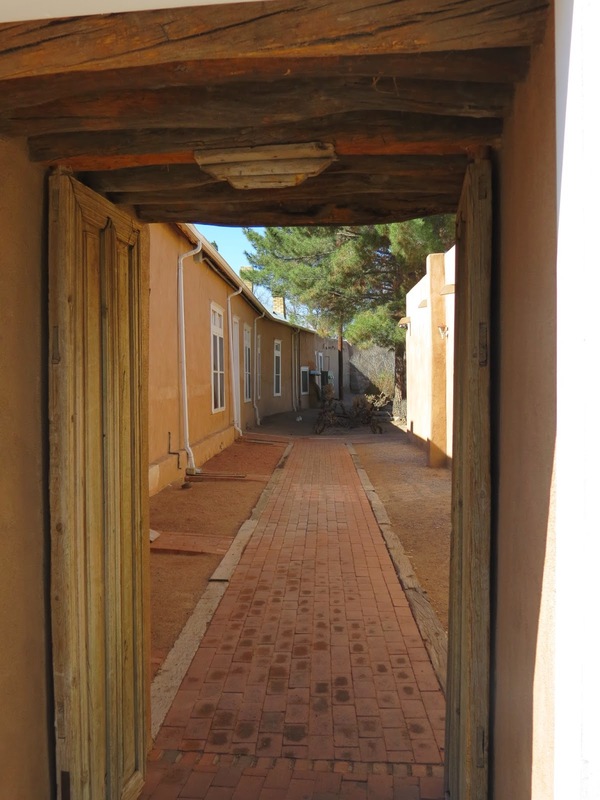 Great care is being given to preserve the original adobe buildings and the beautiful plaza in Medilla. 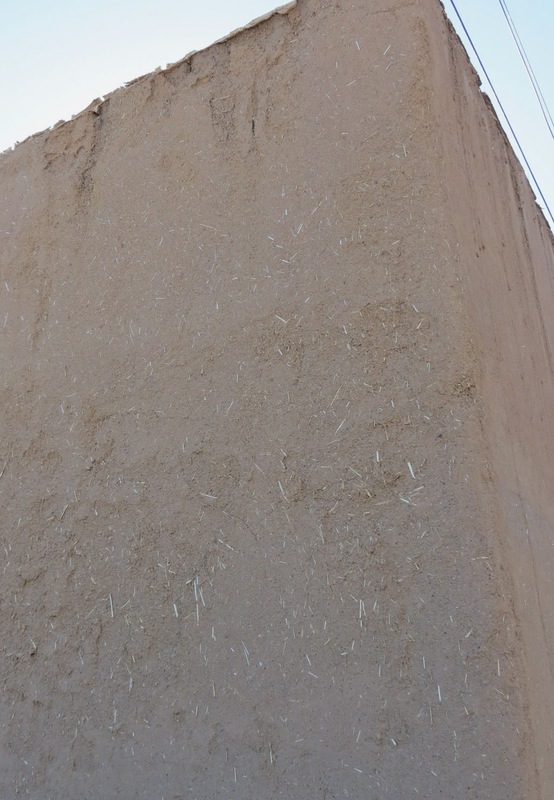 Adobe bricks are being made here to use in restoration of this building. A lot of the doorways were unique. Restored adobe building. Many of these buildings house shops selling arts and crafts. Walking around town looking at the old buildings. Two merchants, Reynolds and Griggs bought this builing in 1860. The Reynolds family added the Italianate bracketed, stamped metal store front added to the building in 1890. THis front was ordered out of a catalog. In 1913 it was used as the rectory. It recently housed a gift shop, but is being renovated inside. A peek at the inside under renovation. This doorway leads to a courtyard between the shops. Oldest brick building in New Mexico? The olive oil shop was closed. And it was a beautiful morning to tour old Mesilla. But our afternoon plans to tour another historic part of Las Cruces was foiled by an incoming cold front bringing strong winds and blowing dust. Tumbleweeds were tumbling across the roads. So we saved that your for another day. Great tour followed by an afternoon where you needed to hide inside.